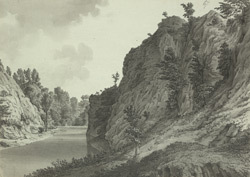 A view in ink of the rocks at Wyke Regis in Dorset, drawn in July 1790. Wyke Regis shows evidence of human habitation stretching back to the stone age. The earliest written record relates to a charter signed by the Saxon King Ethelred II in 988AD. The name Wyke Regis can be loosely translated as 'farm of the King'. At the time Grimm made this drawing, it was a small village whose people lived almost entirely on subsistence farming and fishing.